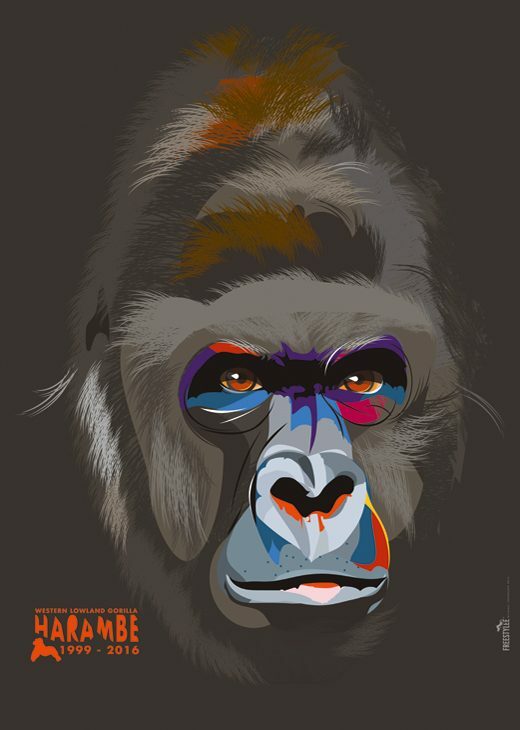 A tribute to Harambe a Western Lowland Gorilla killed at the Cincinnati Zoo. Harambe was 17 years old. SOME FACTS ABOUT THE WESTERN LOWLAND GORILLA The western lowland gorilla occurs in the rainforests of central Africa, specifically in lowland forest and swamp forest from sea level to about 1,600m. Gorillas are mainly herbivorous; their staple foods are pith, shoots and leaves. Fruits are also an important component of western lowland gorillas’ diet and are consumed according to their seasonal availability. Over 100 fruit species have been recorded in their diet. Hunting is the main threat to western lowland gorillas. Gorillas are sought after as food (bushmeat) and pets, and their body parts are used in medicine and as magical charms. The impact of hunting on gorilla population has proven to be dramatic. In North East Congo, it has been estimated that approximately 5% of gorillas are killed by hunters each year. Despite national and international laws prohibit the hunting and capture of gorillas throughout their range, rampant corruption in the wildlife legal system weakens the enforcement of existing legislation. Female western lowland gorillas do not start reproducing until they are around 9 years old. They generally have one offspring every 5 years.